Last of the nine-horse field in Saturday's G2 Holy Bull at first call, Harold Lerner, AWC Stables, Nehoc Stables, Scott Akman and Paul Braverman's Harvey Wallbanger found room at the rail to cross the wire just over a length in front. The 3-year-old son of Congrats, ridden to victory by Brian Hernandez, Jr., surprised bettors at odds of 25-1 in the points race on the Road to the Kentucky Derby. Trained by Ken McPeek, the colt completed 1 1/16 miles over Gulfstream's fast main track in 1:43.69. The 4-5 favorite and previously unbeaten Maximus Mischief broke sharply, but he was overtaken by the speedy Epic Dreamer who shook away to a two-length lead entering the backstretch. Meanwhile, longshot Harvey Wallbanger was at least 10 lengths off the leaders, trailing the field through the early fractions of :23.18 and :46.76. Hernandez crafted a rail-skimming trip for Harvey Wallbanger around the far turn just as Maximus Mischief came up to challenge the frontrunning Epic Dreamer. Moving right alongside Harvey Wallbanger was 99-1 chance Everfast, but jockey Chris Landeros had to swing outside the leading duo of Maximus Mischief and Epic Dreamer in the short stretch run. Harvey Wallbanger got through at the rail, however, and scooted clear to a one-length win over Everfast. Maximus Mischief held on for third over Epic Dreamer. Bred in Kentucky by Tony Holmes and Dr. and Mrs. Walter Zent, Harvey Wallbanger was a $50,000 yearling at the Fasig-Tipton July sale. It took the colt four starts to break his maiden, though he has never finished worse than second; overall, his earnings stand at nearly $300,000. 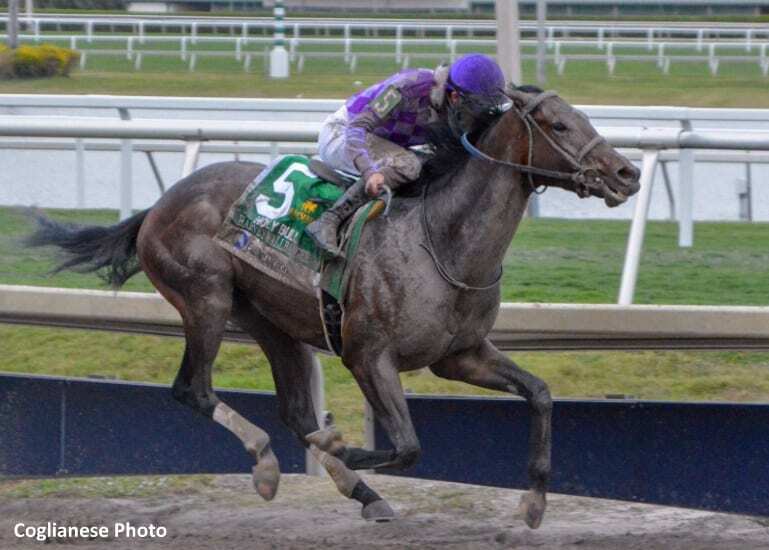 This entry was posted in NL Article, Triple Crown, Videos and tagged brian hernandez, Congrats, Gulfstream, gulfstream park, harvey wallbanger, holy bull, Holy Bull Stakes, ken mcpeek, kentucky derby, maximus mischief, road to the kentucky derby by Paulick Report Staff. Bookmark the permalink.